It happened overnight. My tot went to sleep last night totally clueless and today is a letter genius. Well, okay, not a total genius, but she’s pointing at letters everywhere and yelling them out — sometimes correctly (and mostly not). She sees letters on a sign, she yells them out. She sees letters on the TV, she yells them out. Most of the time she’s pretty sure she’s got it right, causing her to become a bit annoyed when I attempt to correct her. So I’m letting her think a D is whatever she’s calling it at the moment for now. But all this letter yelling did remind me of a painting that I love by Jasper Johns. Yes, we’ve visiting with Johns in the past, but due to the tot’s letter recognition excitement, we are revisiting. From iconic images to big splashes of color, Jasper Johns has been a respected for years. Johns is an Abstract Expressionist artist that uses things that are totally familiar like colors, shapes, or maps, and transforms them into amazing works of art. His lithograph, False Start 1, 1962, tricks the brain with its splashes of color with mismatched color printed names. This is a fun art activity to explore with kids that are just starting to notice letters as well as those beginning to read. My tot isn’t at the reading stage yet but she’s definitely ready for building her letter recognition skills. Gather together a sheet of white paper, some scrap paper, paintbrushes, and red, yellow, and blue paint. Take a look at False Start 1 together and notice the big areas of color and the words written around the artwork. 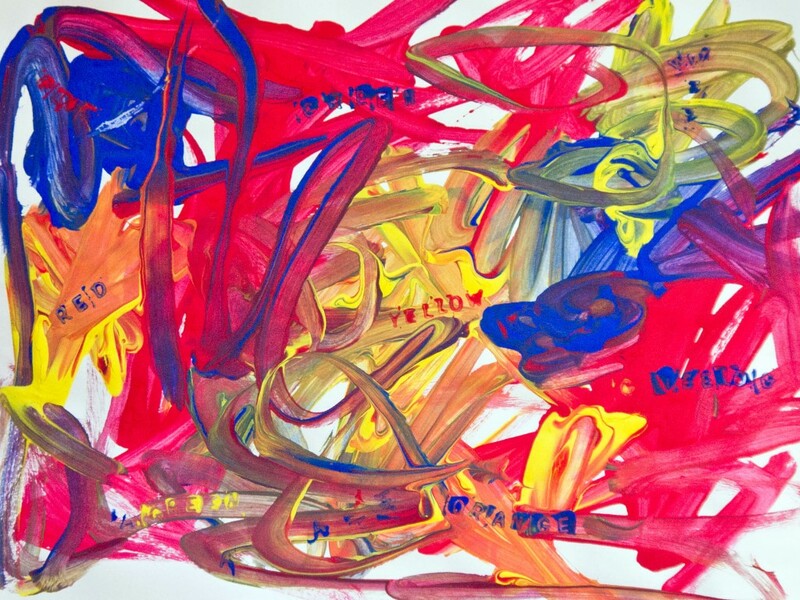 Squeeze a bit of each color of paint onto a piece of scrap paper and invite your child to paint big splashes of color around her paper without blending them too much. Once your child is satisfied with the creation, let it dry while getting out a set of letter stamps. Waiting for paint to dry is no fun, but use the time to go over the letters with your tot. Sing the ABC’s, practice making and stamping words, or go outside and play or something. Once the paint is dry, squeeze a small amount of red, yellow, and blue paint onto a piece of folded paper towel. This is your child’s stamp pad for creating those words on top of the areas of color. Now the tricky part — seeing if your tot can find the right letters to spell a few words! Pick a color to spell out and see if your child can select the letters needed for stamping it onto the painted paper. Go ahead and help out as needed. Now select a color to use for stamping that is different from the area of color. So, if you picked the word “yellow” to stamp, press the letters into the blue paint and then onto the yellow paint. Keep stamping words until your child is happy with the artwork and then let dry. Find a spot to display your Jasper Johns inspired creation for the whole family to see. My tot started out strong and then got caught up with stamping the letter W just about everywhere she could. Oh well. I think things turned out just fine.